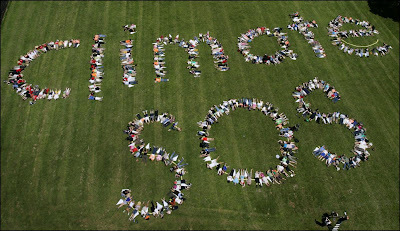 Greenpeace in conjunction with Oxfam and Forest&Bird is brainwashing schoolkids in "Climate Change" propaganda. 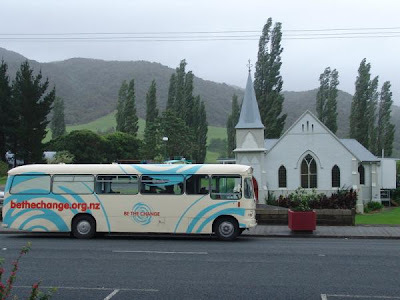 For the last month, a bio-fuel powered bus has been touring New Zealand high schools indoctrinating teenagers in Greenpeace's scaremongering "global warming" agenda. Worse, Greenpeace's Be the Change project is staffed by radical extremists with ties to some of this countries most militant activists, including the Save Happy Valley Coalition and the "Urewera 17". Kristin Gillies has been a leading member of the anarchist lead Save Happy Valley Coalition and has allegedly attended at least one "quasi military" training camp in the Ureweras. Jo McVeagh was a founder member of the SHVC in 2004 and has since worked closely with socialist and anarchist organisations. Tia Taurere has close ties to several of those arrested in the October 15 "Urewera 17" anti terror raids and has since been an active campaigner for their cause. These three activists are being paid by Greenpeace to indoctrinate teenagers from Cape Reinga to Bluff. How many parents would allow their children to hear Greenpeace's dodgy propaganda, if they knew the pedigrees of those promoting it? I think there are too many scientists who adhere to the AGW hypothesis for it to be part of a plot, however the fact(?) of AGW suggests a different model of the world in which there are limits. This is new territory and various ideas (including some radical ones) are competing or evolving to fill the vacuum. When I was at Primary and Intermediate school some Greenpeace anti-whaling people came to hold workshops for us. Never did me any harm ;) In fact I would probably class them as some of my favourite most memorable days at school. What a complete load of bile! What's happened to you that made you so vindictive Trev? Did someone brainwash and indoctrinate you? CAMERON-PERHAPS THAT WAS YOUR FIRST STEP TO THE "DARK SIDE"
PETE-I WAS BULLIED AT INTERRORGATORS SCHOOL. The Greens are probably also subtly pushing their soft-on-drugs agenda. Thanks for this posting. This kind of anit-capitalist, anti-west, message is being heard here in Canadian schools as well. My nieces have to listen to their teachers pushing political global warming nonsense at them all the time. Thankfully they aren't easily fooled.